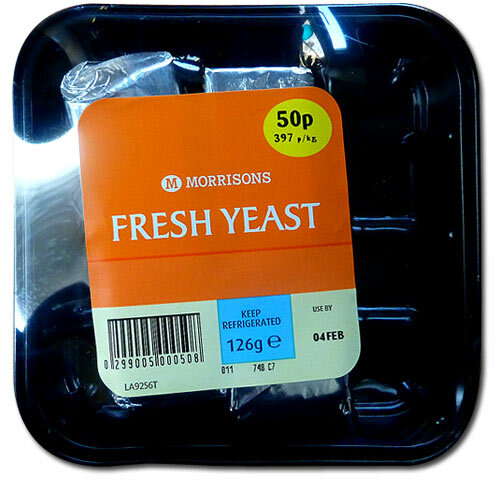 Well I never, I’ve just discovered our local Morrisons now sells packets of fresh yeast for breadmaking… and at the very reasonable price of 50p for 126g. This was unexpected because a) as far as I know you can’t even get it at Waitrose, and b) Morrisons is very much at the (Sp)Asda end of the supermarket spectrum and tends more towards the processed and ‘value added’ convenience foodstuffs. In fact they still seem to think of olive oil as an exotic foreign embrocation for loosening earwax rather than a middle class kitchen essential and prefer to bottle it in vials and shelve it in the ‘Health and Beauty’ aisle somewhere between nit shampoo and Tena Ladies. Supermarket snobbery aside, I’ve never used fresh yeast before so I did an AW-T, slipped a packet up my chef whites and made a run for it. Fresh yeast is not as potent and dried yeast, so you’ll need three times the amount. 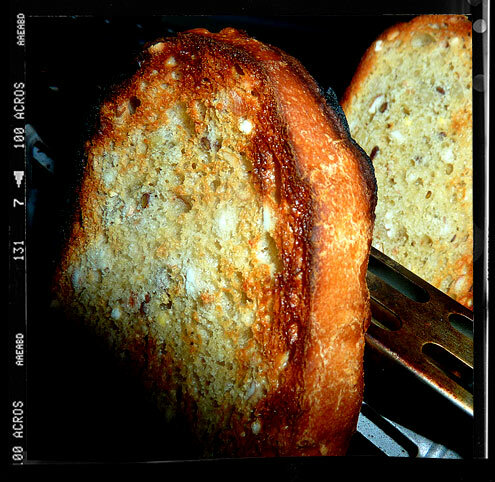 Therefore if a recipe requires 2tsp of dried yeast (1tsp = 5g), you’ll be needing 30g of fresh yeast. In a large bowl mix together the flour, salt and sugar. Crumble the fresh yeast into the warm water and stir to dissolve. 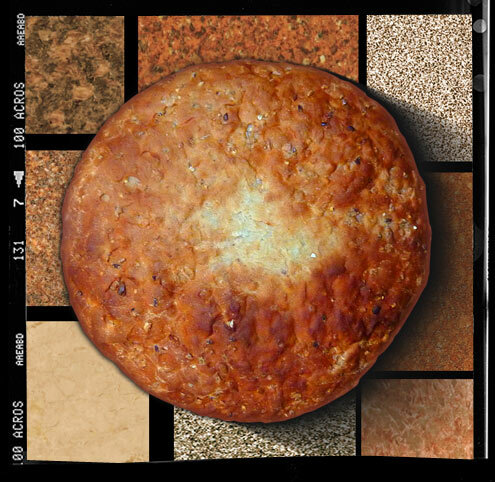 Pour onto the flour and mix together to form a rough dough. Add the oil and knead into the dough. Turn out onto a floured surface and knead for 10 minutes until smooth and elastic. 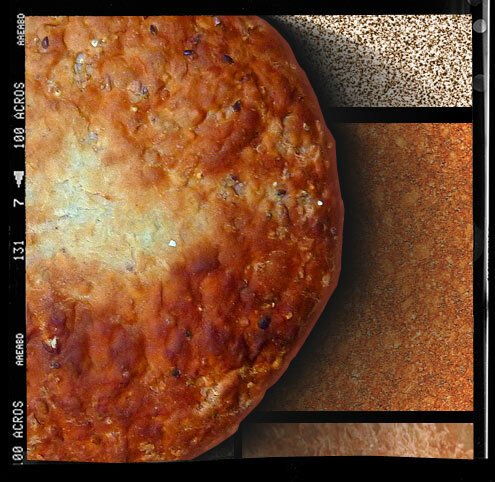 Divide into two and shape into round loaves and place on oiled baking sheets. Bake in the oven for 15 minutes, then reduce the temperature to 200°C/Gas Mark 6 and bake for a further 15-20 minutes until golden brown and hollow sounding when tapped on the bottom. Verdict: A good all rounder which is great either each end of a sandwich or toasted and heavily buttered. The was no noticeable difference between this loaf and one made with dried yeast … it did seem to rise a little faster though. Entertainment: Watching with equal parts alarm and ammusement as Yumblog Junior gets ever more independent and bossy. Might I also recommend from Morrisons, mixed grain bread mix (Wrights), at 80p for a 400g loaf, and you don’t even need the smug aspiring middle class foodie fresh yeast. Just water, hands and an oven, although a bottle of french rosé helps build strength ahead of the kneading process. I found fresh turmeric in my local Morrisons the other day. Yes, fresh turmeric. And if it’s a jar of organic white tahina you’re after – this is, bafflingly, the place to go. This is a shop that frequently fails to stock exotic and unusual things like celery, avocado, organic whole milk and good bread (actually, they’ve never had good bread). I can only assume the buyers are drunk. I know I would be.